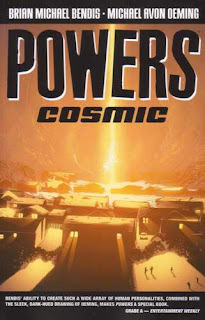 It can be tough to get into a comic book so rich with developed characters as Brian Michael Bendis and Michael Avon Oeming's Powers, but whether you know the back histories or not the tenth trade paper back in the Powers run, Cosmic, is an excellent book. Cosmic begins with a seemingly random man, outside looking for his dog, getting split in two by a super powered person falling to the earth. The super powered character just gets up and flies away leaving one man dead and a homicide to be solved by the detective team of Christian Walker and Deena Pilgrim. The dead man turns out to be a super-powered defender of the earth's section of the galaxy. He was like a Green Lantern or a Nova Corp member. This fact, which is later revealed when his home is searched, adds a wrinkle to the investigation. It should be noted that in the Powers universe using super powers is illegal. Detective Christian Walker used to be a superhero, but lost his powers and now does his part as a detective. In Cosmic, Walker is chosen by the galactic entity in charge of the designating of powered protector in the earth sector. So in Green Lantern, when a Lantern Corp member dies the ring finds a worthy new person to become the next Lantern. In Powers some alien gives a worthy person the opportunity. The alien says, "You down or what?" I really enjoyed this story, not for the interesting characters or the world of Powers, but rather because the person who was killed is killed for a reason unlike many other stories which rotate around a "who done it" and "why" story. When the killer is found the "why" seems refreshingly new, yet at the same time not elaborate. 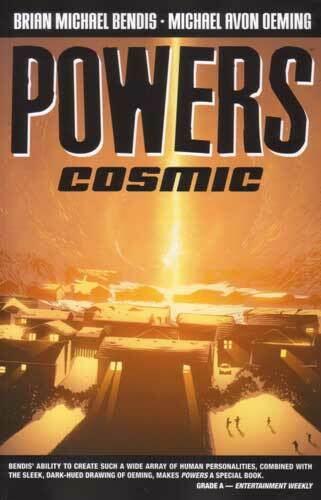 This comic of the day, Powers: Cosmic (Vol.10), is a good story which will get readers into the series and looking for back volumes. The characters are interesting but more importantly, if the other volumes are anything like this one, they will contain fresh takes on worlds where people have powers.